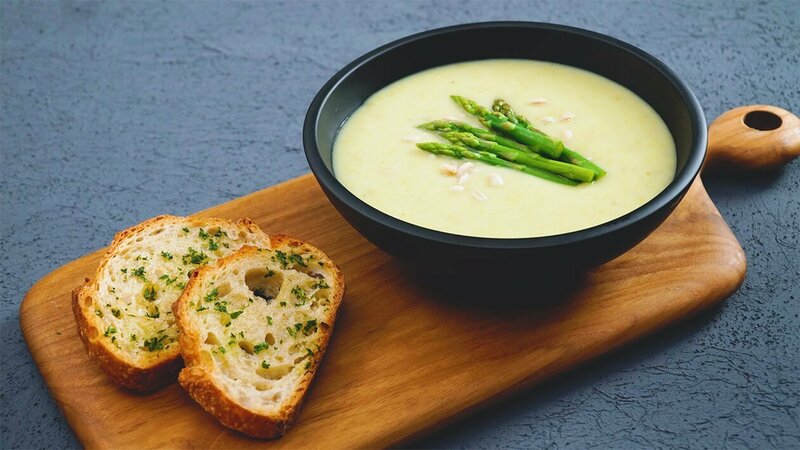 Try serving up this creamy Roasted Asparagus Soup for diners who are looking for something warm, homey & healthy! Add some barley for added bite to create a lovely Soup of the Day option that leave your guests coming back for more. On a skillet, heat your olive oil and butter, then add in your onions. Season with salt to draw out the onion’s moisture, then add in your asparagus. Toss them for about 2 minutes, or until the onion caramelizes and the asparagus changes color. Set aside and save some Asparagus heads for garnishing later. Pour 1 cup of water in a pot. Add in some salt and 1 tsp of KNORR Aromat Powder. Place in your Pearl Barley, and bring to a boil over medium heat, adding water if necessary. Let it simmer for about 40 minutes or until the liquid is absorbed. Set aside. Add in your roasted asparagus and onion mixture into a pot under medium heat. Pour in your water and let it simmer for 8-10 minutes. When the vegetables are soft, remove from heat and place in the blender. (If your blender is made of plastic, let the mixture cool first before pouring it in). Blend until smooth and transfer back to the pot. Let the soup simmer over medium to low heat. Season with KNORR Aromat Powder, and salt and pepper. Bring to a boil, turn off the heat. Add in your barley and mix together. Pour your Roasted Asparagus Soup with Barley in a soup bowl, and sprinkle with barley. Garnish with some roasted asparagus heads.